So, when I say hot cocoa, what words come to mind? Rich, delicious, warm, sweet, creamy, decadent, comforting, relaxing. Did I miss any? Seriously, who doesn't like hot cocoa? It's the perfect thing to have when you want to put your feet up and relax on a cold night. I like to start with the basic recipe and then try different variations. Some are perfect for the little ones, others are just for Mom and Dad. Even if you serve it without any of the variations, it'll always hit the spot! Combine the cocoa, sugar and pinch of salt in a saucepan. Blend in the boiling water. Bring this mixture to an easy boil while you stir. Simmer and stir for about 2minutes. Watch that it doesn't scorch. Stir in 3 1/2 cups of milk and heat until very hot, but do not boil! Remove from heat and add vanilla. Divide between 4 mugs. Add the cream to the mugs of cocoa to cool it to drinking temperature. Top each mug with whipped cream and chocolate shavings or a dusting of more cocoa powder, if desired. -Stir your cocoa with a candy cane or a cinnamon stick. 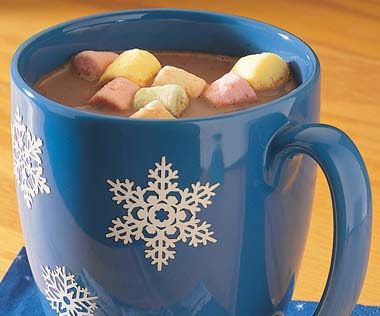 -Float some miniature marshmallows in each mug or top with a dollop of marshmallow fluff. Want something REALLY rich and decadent? Substitute half and half for some (or all) of the milk. To add a deeper level of flavor, place a whole vanilla bean in a small pot with the milk. GENTLY simmer it until the milk is infused with the vanilla flavor and then add it to your cocoa as directed. For a spicy twist, add a pinch of cayenne pepper!